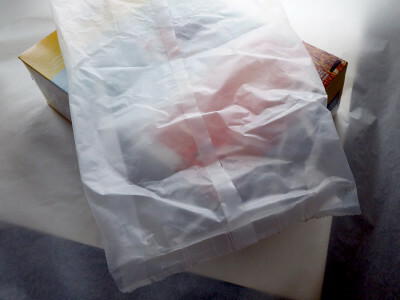 Always looking for ways to recycle household packaging (and a huge fan of my sacred morning ritual), one of my favorites is the plastic lining in cereal boxes. They get a lot of use during gardening season, being a great way to store greens like lettuce, kale and arugula. Liner bags can be rinsed out easily, closed with a chip clip and seem to keep produce fresh for a fairly long time. The kitchen is always well-stocked with them, but after a certain point, the line between saving and hoarding gets a little blurry. Throughout the winter months, it seems like a such a shame to throw the liners away. Kale and arugula grew through November, but in the last few months, you wouldn’t be able to find them under the snow if it survived. Today they got a chance to stay out of the trash a while longer. They also come in handy as mold liners for soapmaking, crushing recipe ingredients like nuts or cookies (ohh, Oreo truffles! ), separating food for freezing, or lining small wastebaskets and most of the ways you’d think to use storage bags or waxed paper. To store the bags, you can do even more recycling. 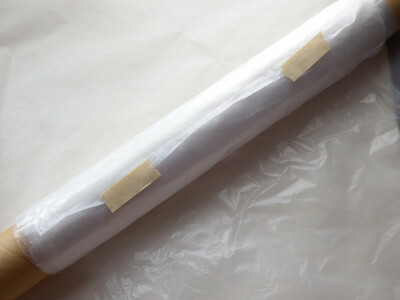 Use a roll from paper towels, large fabric purchases or anything that makes a cylinder and whose length pretty much matches the short side of your flattened liner. Here, I used a fabric roll, cutting it down to size with a hacksaw. It’s wider than the liners, since I have a couple of family-size boxes of cereal in the cupboard and I want it to fit them when the time comes. Just tape them to the roll to start, then tape the newest one to the last one on the roll. They’ll take up a lot less room and you won’t have to deal with them slipping and sliding everywhere. And when you’ve used them as many times and ways as you can, they’re usually made of #2 plastic. Some brands tell you how the box and liner can be recycled on the package. They may be able to go into the recycle bin, if your community takes #2 plastics or a store drop-off point, if they don’t. Most communities have plenty of info about what they will and won’t take, so check first. What’s not to love? I restart my collection of these for the studio until I see little green bits poking up from the ground.